ADPKD is a multisystem disorder characterized by bilateral renal cysts, extrarenal cysts, and cardiovascular abnormalities (1). The importance of hypertension and the vascular manifestations of ADPKD is underscored by the fact that the leading cause of death in this disease is cardiovascular (2). Hypertension develops early in the course of ADPKD, affects most patients, and is a predictor of renal functional decline (3). The cardiovascular lesions are characterized by the disruption of the elastic tissue (internal elastic lamina in intracranial aneurysms [ICA] and dolichoectasias, elastic lamellae in aortic and cervicocephalic artery dissections, and elastin fibers in the floppy mitral valves) (4–8⇓⇓⇓⇓). Clustering of ICA has been described in certain ADPKD families (9,10⇓), and mutation analysis has demonstrated an association of the location of mutations in the PKD1 gene and the occurrence of ICA (11). The ADPKD proteins polycystin-1 (PC1) and polycystin-2 (PC2) are expressed in vascular smooth muscle cells (VSMC) (12,13⇓). Mice with targeted Pkd1 null mutations (at exons 17 to 21 or exons 43 to 46) die at midembryonic stages with massive hemorrhage (14–16⇓⇓). Mice with a Pkd2 null mutation (exon 1) also die between E13.5 to E18 with cardiac defects and hemorrhages (17,18⇓). Therefore, it seems likely that the function of the polycystins is essential to the development and maintenance of the myoelastic structural organization of the vasculature. Studies from epithelial cells and other non-smooth muscle cell systems have shown that both PC1 and PC2 are glycosylated integral membrane proteins (17,19,20⇓⇓). PC1 is a 460-kD glycoprotein with a large extracellular region, 11 transmembrane (TM) domains, and a short cytoplasmic tail. The extracellular region contains multiple adhesive motifs and may play a role in cell-cell and/or cell-matrix interaction (19). The cytoplasmic tail contains a coiled-coil motif and several putative phosphorylation sites and has been shown to interact in vitro with the C-terminal domain of PC2 (21), heterotrimeric G proteins (22), and regulators of G protein signaling (23). PC2 is a 110-kD glycoprotein with 6 TM spans and cytoplasmic C- and N-tails (17). PC2 has significant homology with the last 6 TM domains of PC1, the transient receptor potential (TRP) channels (24), and the α-1 subunits of voltage-activated calcium channels. PC2 has been reported to interact in vitro with TRPC1 (25), Hax-1 (a protein that forms links with the actin cytoskeleton) (26), and the CD2 adapter protein (27), as well as PC1 (20,21⇓). Uncertainty persists regarding the subcellular localization of PC1 and PC2. Several studies, in epithelial cells, have located PC1 on the plasma membrane (20,28–30⇓⇓⇓). PC2 has mainly been found in the endoplasmic reticulum (ER) (17,31⇓) and in the primary cilium (32–34⇓⇓). Glycosylation analyses have shown that a fraction of PC1 is Endoglycosidase H (Endo H) resistant (20), which is characteristic of proteins that undergo further posttranslational modification of carbohydrate residues in the Golgi and move to the plasma membrane, whereas PC2 is completely Endo H sensitive (17), which is consistent with a localization restricted to the ER and/or cis Golgi. Two recent studies, however, indicate that PC2 may also be present on the plasma membrane (35,36⇓). Electrophysiologic studies have demonstrated that under certain conditions (coexpression with PC1, overexpression, and treatment with chaperones or proteasome inhibitors, and recently apical membranes of hST), PC2 can function as a poorly selective, high-conductance cation channel at the plasma membrane (30,32,37,38⇓⇓⇓). The function of native PC2 under physiologic conditions is less certain. A recent study has provided evidence that PC2 is expressed in the ER of PKD2 transfected kidney epithelial cells and functions as an inositol 1,4,5-triphosphate (Ins P3) sensitive channel that mediates calcium release from intracellular pools (39), whereas another study has suggested that ciliary PC1 acts as a mechanosensor that transmits an extracellular signal to PC2, which in turn produces sufficient Ca2+ influx to activate intracellular ryanodine receptors through a Ca2+-induced Ca2+ release (33). Despite their clinical importance, little is known about the pathogenesis of the cardiovascular manifestations associated with ADPKD. Although there have been a number of published studies, mainly using immunofluorescent staining, showing the expression of PC1 and PC2 in VSMC (12,13⇓), there are no published studies on the developmental regulation of their expression, subcellular localization, and interaction in these cells. The present study was undertaken to characterize the pattern of expression, subcellular localization, and interaction of the polycystins in VSMC. W/T C57/BL6 mice were purchased from Jackson Laboratories (Bar Harbor, ME). The transgenic mice carrying full length human PKD1 have previously been described (40). All animal experiments conducted here were approved by the Institutional Animal Care and Use Committee. Embryos were dated by appearance of the vaginal plug, which was designated as day 0. Pregnant animals with appropriate plug dates were anesthetized with pentobarbital (40 mg/kg), and the uterus was dissected out and rinsed in 20 ml of Hanks balanced salt solution (HBSS), and the fetuses were removed in a tissue culture hood under sterile conditions. For isolation of the thoracic aortas from adult animals, the animals were anesthetized as above, midventral incisions were made, and the thoracic aortas were dissected out under sterile conditions. The thoracic aorta from each embryo and adult animal was washed extensively with HBSS containing penicillin (250 units/ml) and streptomycin (260 μg/ml) before proceeding with the primary culture procedure. The genotype of the transgenic animals was determined by Southern blot analysis (40). Given the limited amount of tissue material, a primary explant method was used to establish the VSMC cultures. The tunica adventitia and intima of the isolated aortas were dissected out by scraping, and the tunica media was chopped into ≈1-mm pieces. After washing with HBSS containing penicillin/streptomycin (5×), the pieces were transferred into T25-cm culture flasks containing DMEM with 10% FCS. Capped flasks were incubated at 37°C with 5% CO2, and the media were changed every other day until the cells reached confluence. The purity of the VSMC was confirmed by homogeneous positive staining with a smooth muscle α-actin mAB (Sigma), which is VSMC specific and distinguishes the VSMC from fibroblast contamination (41). Cells from confluent primary cultures were lifted with 0.05% trypsin and 0.53 mM EDTA, pelleted (5 min at 1000 × g) and lysed in buffer A (150 mM NaCl, 0.1% Triton X-100, 1% sodium deoxycholate, 2 mM EDTA, 5% glycerol, and protein inhibitor tablet [Roche Laboratory]) for 10 min at 4°C. For Western analysis, the postnuclear supernatant was obtained by spinning the whole-cell lysate at 1500 × g for 10 min, and the protein content was determined by a microtiter Lowry assay (Bio-Rad, Hercules, CA). Five to 40 μg of protein was denatured in the sample buffer (125 mM Tris [pH 6.8], 5% β-mercaptoethanol, 6% SDS, 20% glycerol, and 0.2% bromphenol blue) at 65°C and subjected to SDS-PAGE on Tris-Acetate 3 to 8% gradient gels (Invitrogen, Carlsbad, CA). Fractionated protein was electrotransferred to a PVDF membrane (Invitrogen) and detected with the appropriate antibodies (AB) using ECL chemiluminescence (Santa Cruz Biochemicals, Santa Cruz, CA). For immunoprecipitation, the postnuclear supernatant was preincubated with protein A Sepharose beads at 4°C for 1 h. After the beads were pelleted, the supernatant was incubated with the appropriate primary AB and protein Sepharose A/G beads at 4°C for 3 h, pelleted, washed 5× with buffer A, and eluted with 1× sample buffer at 65°C for 15 min. 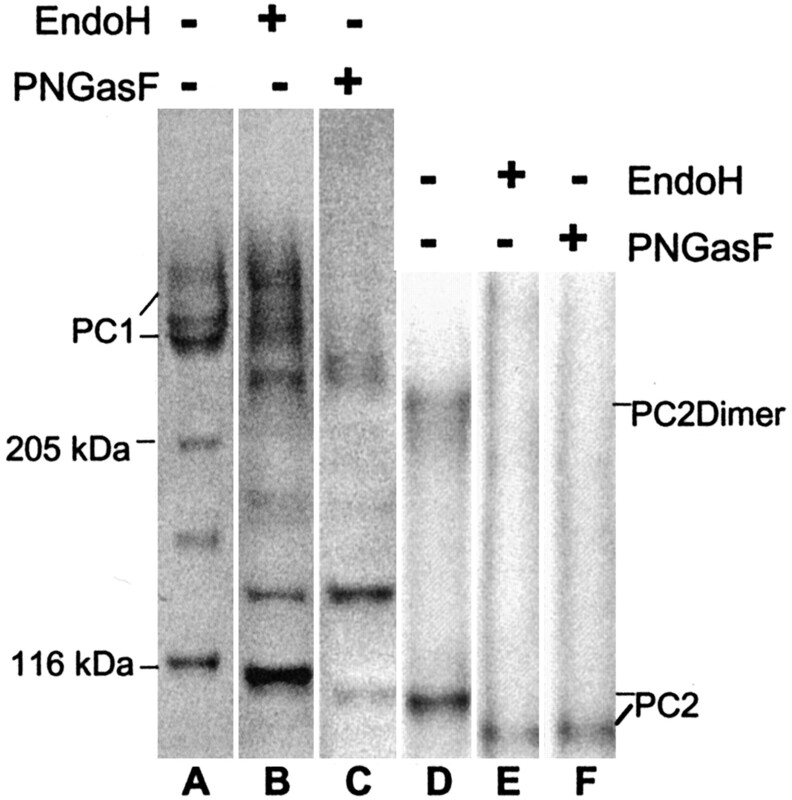 The eluted proteins were subjected to SDS-PAGE and Western blot analysis as described above. The EZ-Link Sulfo-NHS-Biotinylation Kit (Pierce, Rockford, IL) was used for biotinylation following the manufacturer’s protocol. Briefly, cells were washed 3× with ice-cold phosphate-buffered saline with calcium and magnesium (PBSCM), incubated with EZ-link Sulfo-NHS-Biotin at a final concentration of 0.5 mg/ml in PBSCM for 20 min at 4°C, and washed with ice-cold glycine (100 mM) in PBSCM to quench unbound labeling reagent (2×), and finally with ice-cold PBSCM (2×). Biotinylated cells were scraped off the plates and lysed in RIPA buffer (150 mM NaCl, 5 mM EDTA, 50 mM Tris-HCl [pH 7.4], containing 1% Triton X-100, 0.5% sodium deoxycholate, 1% SDS, and an EDTA-free protease inhibitor mix) on ice for 10 min. When indicated, the cells were permeabilized with streptolysin O (SLO; Sigma Chemical Co., St. Louis, MO) immediately before the biotinylation (42). An aliquot of the SLO stock solution (25,000 units/ml water) was diluted 70-fold into SLO buffer containing (in mM) 2.5 MgCl2, 1.0 dithiothreitol, 115 potassium acetate, and 25 HEPES/KOH (pH 7.4). Cells were washed with ice-cold SLO buffer (2×), then incubated with ice-cold SLO-containing solution at 4°C for 15 min, rinsed with ice-cold SLO buffer (2×), and then incubated in prewarmed SLO buffer at 37°C for 30 min. Cells were finally washed with ice-cold SLO buffer (2×) and PBSCM (2×) before biotinylation. For digestion with Endo H, 20 to 40 μg of protein was denatured in 1× denaturing buffer (5% SDS, 10% β-mercaptoethanol) at 100°C for 10 min, 1/10 volume of 10× G5 buffer (New England Biolabs, Beverly, MA) and 1 μl of Endo H (500 units) added and incubated at 37°C for 1 h. For digestion with Peptide:N-glycosidase F (PNGase F), 20 to 40 μg of protein was denatured in 1× denaturing buffer (5% SDS, 10% β-mercaptoethanol) at 100°C for 10 min, 1/10 volume of 10× G7 buffer (New England Biolabs), 10% NP-40, and 1 μl of PNGase F (500 units) added and incubated at 37°C for 1 h.
Cells that were grown to subconfluence or confluence on glass slides were fixed with 2.5% freshly made paraformaldehyde (pH 7.6) and permeabilized when indicated with methanol and acetone (at 3:1 ratio) for 10 min. After washing with PBS (3×), primary AB (in PBS with 10% goat serum) were added to the cells and incubated for 45 min. The slides were washed (3× PBS), and FITC or TRD-conjugated secondary AB were added. Control cells were with just the primary or the secondary AB. The cells were examined using a confocal immunofluorescent microscope. Specimens were fixed in 4% formaldehyde and 1% glutaraldehyde in PBS, rinsed in PBS, postfixed in 1% osmium tetroxide in PBS, rinsed in water, en bloc stained in 2% uranyl acetate, and again rinsed in water. Dehydration was in a series of ethyl alcohols ranging from 60% to absolute and infiltrated with propylene oxide plus Spurr resin. After two changes in 100% Spurr, the specimens were embedded and the resin was polymerized at 65 to 70°C. Thin sections were mounted on nickel grids and dried overnight. Nonspecific antigen sites were blocked first in 1% glycine then in PBS and 0.05% Tween 20 (PBST) with 2% goat serum. The primary AB (monoclonal PC1 AB, 7e12 or polyclonal PC2 AB, P30) were diluted 1:50 in PBST, and sections were incubated in primary AB for 2 h at room temperature. Grids were rinsed in PBST and incubated for 1 h in appropriate secondary AB conjugated to 5 nm of colloidal gold. The grids were then rinsed in PBST and water (5×). The sections were dried and silver-enhanced for 2 to 4 min, then stained with uranyl and lead. 7e12 is a mAB raised against leucine-rich repeat motif of human PC1 (17). P30 is a polyclonal AB raised against C-terminal 258 amino acid of human PC2 (17). Mouse mAB YCE2 for human PC2 was generated by standard hybridoma technology in the Hybridoma Facility of Albert Einstein College of Medicine. A GST-fusion protein derived from a COOH-terminal portion (amino acids 687 to 754) of human PC2 was used to immunize Balb/C mice whose spleens were used for hybridoma fusion. The AB specificity was characterized by immunoprecipitation, immunocytochemistry, and Western blotting on transfected cells and native tissues as well (Y Cai and S Somlo, manuscript submitted for publication). Unless otherwise specified, all reagents used in this study were obtained from Sigma. Primary cultured aortic VSMC were isolated from W/T C57/BL6 mice at E17, newborn, and 3 mo of age for the purpose of determining the expression of Pkd gene products. All experiments were carried out on confluently cultured VSMC at early passages (2 to 4). Western analysis of freshly isolated VSMC was not possible because of the paucity of material. The smooth muscle cell phenotype was confirmed by immunostaining with an SMC-specific α-actin mAB (Figure 1). Western analysis showed that PC1 and PC2 were expressed in primary cultured VSMC, consistent with previous immunohistologic data (12,13⇓). PC1 was detected with 7e12, a mAB to the N-terminal region of human PC1, which cross-reacts with mouse PC1 (Figure 2A). Similar to the analysis of the renal epithelial cells (20), several bands of >400 kD were detected, as well as three smaller size protein products. The larger bands (>400 kD) likely represent full-length PC1 with variable degrees of glycosylation, whereas the smaller bands (<220 kD) may be cleaved and/or alternatively spliced Pkd1 gene products. To determine the development pattern of PC1 and PC2 expression, quantitative Western analysis was undertaken, which showed that PC1 has a significantly higher level of expression in VSMC at E17 and newborn compared with the adult stage, when it is significantly downregulated (Figure 2A). PC2, on the contrary, was expressed at a more constant level with no significant decrease at 3 mo of age (Figure 2B). Analysis of VSMC from adult PKD1 transgenic (TPK1) animals that contain approximately 30 copies of human PKD1 showed a much higher level of PC1 expression and were subsequently used in some analysis of PC1 in this study. The level of PC2 expression was not significantly different in the PKD1 transgenic animals (data not shown), indicating that overexpression of PC1 did not alter PC2 expression. Figure 1. (A) Confluent culture of vascular smooth muscle cells (VSMC) from the thoracic aortas of wild-type mice. Bar = 20 μm. (B) Primary cultured cells stained for SMC-specific SM α-actin mAB (wild type) that differentiates VSMC from fibroblasts. Bar = 1 μm. Figure 2. Quantitative Western analysis (5 μg of protein used for each loading). (A) Primary cultured VSMC from W/T E17, W/T newborn, W/T 3-mo-old, and PKD1 transgenic 3-mo-old mice. The expression of PC1 is developmentally regulated with much lower level in the adult and is truly detected when more protein (30 μg; right lane) is loaded. The transgenic adult mice express a higher level of PC1. (B) Primary culture VSMC from W/T newborn and W/T 3-mo-old mice showed that expression of PC2 was more constant. To determine whether PC1 and PC2 physically interact in VSMC as previously reported in epithelial cells, immunoprecipitation studies were carried out. Proteins isolated from primary cultured VSMC from 3-mo-old TPK1 mice were precipitated with the PC2 AB P30 (polyclonal) or YCE2 (monoclonal). Both polyclonal and monoclonal PC2 AB produced identical results. Two large molecular weight bands (>400 kD), with a size corresponding to the top PC1 products on Western analysis, were recognized by the PC1 mAB (7e12), consistent with interaction between PC1 and PC2 (Figure 3A). To confirm that PC1 and PC2 interaction was not due to PKD1 transgenic effect, we carried out identical experiments in proteins isolated from W/T newborn VSMC. As depicted in Figure 3B, native PC1 was immunoprecipitated by PC2 AB, confirming the existence of in vivo PC1 and PC2 interaction. The smaller 220-kD PC1 protein band was not immunoprecipitated by the PC2 AB (P30 or YCE2), suggesting that it may represent a truncated form of PC1 lacking the C-terminal tail that interacts with PC2. Detection of YCE2 precipitated proteins with the PC2 AB (P30) showed the expected PC2 product of 110 kD as well as a large product at approximately 220 kD, suggesting that PC2 may form dimers in VSMC (see glycosylation study below). Figure 3. Immunoblots of VSMC protein from TPK1 (A) and W/T newborn (B) mice immunoprecipitated with the PC2 mAB YCE2 and detected with PC1 mAB 7e12 and PC2 polyclonal antibodies (AB) P30, showing PC1 products immunoprecipitated by the PC2 antibody and the presence of the monomeric and dimeric PC2. For determining whether PC1 and PC2 interact on the cell surface of VSMC, the surface proteins of primary cultured TPK1 VSMC were biotinylated. These proteins were immunoprecipitated with the PC2 mAB (YCE2), and the biotinylated proteins were detected with streptavidin. This analysis revealed a cell surface protein >400 kD that was similar in size to the smaller PC2 immunoprecipitated protein detected by 7e12. This result suggests that of the two populations of PC1 that interact with PC2, only one population is located on the plasma membrane of VSMC, whereas the other was not biotinylated and likely located intracellularly. The analysis of the immunoprecipitated proteins with the PC2 mAB YCE2 showed that no detectable amounts of PC2 monomers or dimers were biotinylated on the cell surface (Figure 4A). However, when the same cells were briefly permeabilized before biotinylation, PC2 (both monomers and dimers) were biotinylated (Figure 4B). These results indicate that, in VSMC, PC2 is either absent from the plasma membrane or present at levels that are below the sensitivity of detection by cell surface biotinylation. Figure 4. (A) Immunoblots of cell surface biotinylated protein, immunoprecipitated with PC2 mAB YCE2 and detected with streptavidin, 7e12, and P30. A subpopulation of PC1 is biotinylated and precipitated by YCE2. PC2 is not biotinylated. (B) Immunoblots of the biotinylated protein prepared in parallel with and without SLO permeabilization (Perm and non-Perm), immunoprecipitated by YCE2 and detected by streptavidin. Only PC2 from the permeabilized cells is biotinylated. For defining the subcellular localization of PC1 and PC2, dual color immunofluorescence confocal examination of primary cultured VSMC from E17 W/T was carried out. Significant co-localization of the PC1 signal (7e12 red) and PC2 signal (P30 green) was found (Figure 5, top). However, most of the staining seemed to be cytoplasmic, consistent with much of the protein being located intracellularly, possibly in vesicles and sarcoplasmic reticulum. To elucidate further the subcellular localization of polycystins, VSMC were subjected to a brief (10 min) 0.5% Triton-X extraction before fixation and immunodetection. 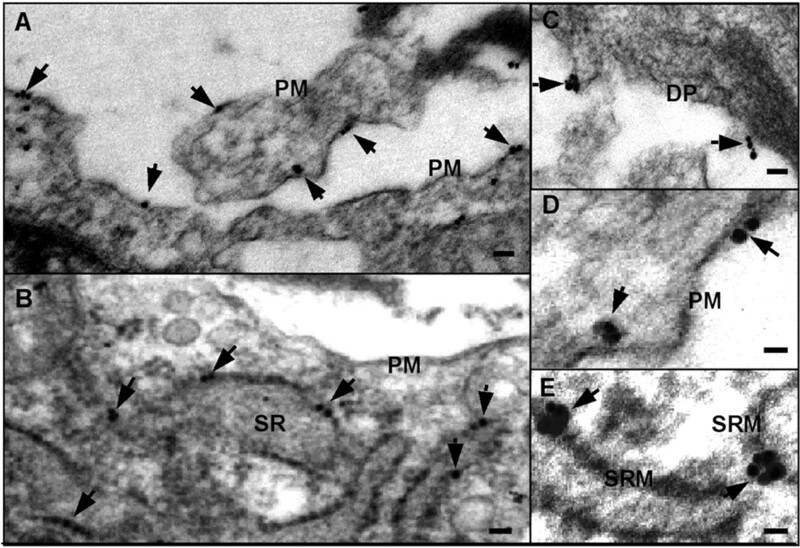 In this analysis, there seemed to be a fraction of PC1, localized in proximity to the cell surface, probably in the plasma membrane cytoskeletal complex (Figure 5, bottom). No clear surface localization of PC2 was detectable after the Triton-X extraction. Figure 5. (Top) Wild-type (E17) VSMC stained with 7e12/Red (A) and P30/Green (B) and merged picture (C), showing co-localization of PC1 and PC2. 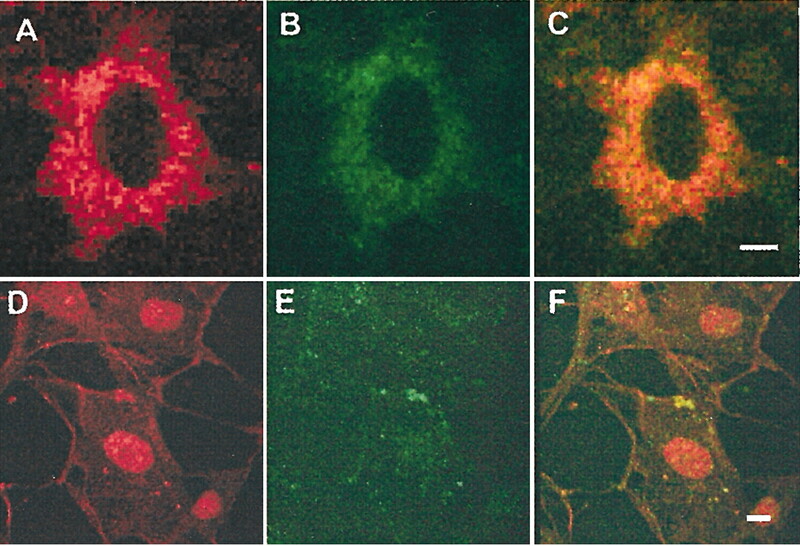 (Bottom) Wild-type VSMC treated with 0.05% Triton-X for 10 min before fixation and stained with 7e12/Red (D) and P30/Green (E) and merged picture (F), showing a subpopulation of PC1 located on or close to the plasma membrane and attached to the cytoskeleton. Bars = 5 μm. To complement the immunofluorescent study and to examine whether the polycystins participate in the formation of the myoelastic unit, the ascending aorta from wild-type E17 mouse was examined, after Immuno-gold staining with PC1 (7e12) and PC2 AB (YCE2 and p30) under the electron microscope. As shown in Figure 6, PC1 was found in the plasma membrane and sarcoplasmic reticulum while PC2 is mainly located in sarcoplasmic reticulum. These data are consistent with the findings in the immunofluorescent confocal microscopy as well as the cell surface biotinylation studies (shown below). PC1 and PC2 were also found to be associated with dense plaques, suggesting a possible role of polycystins in the development and maintenance of myoelastic units. Figure 6. Immuno-gold staining with the monoclonal PC1 (7e12; A) and PC2 (P30; B) AB. Positive staining of PC1 on the plasma membrane (PM) and PC2 in the sarcoplasmic reticulum membrane (SRM) is shown. Bars = 50 nm. (C) Example of a dense plaque (DP) staining with P30. Bar = 35 nm. (D and E) Magnified views of the PM and the SRM staining. Bars = 20 nm. The arrows indicate the silver granules detected by electron microscopy. To determine whether PC1 and PC2 are glycosylated in VSMC as previously reported in epithelial cells, we subjected VSMC proteins isolated from the W/T newborn and PKD1 transgenic mice to digestion with PNGase F and Endo H. Consistent with previous reports in epithelial cells, we found that PC1 and PC2 are sensitive to both PNGase F and Endo H in VSMC (Figure 7). However, there were subpopulations of PC1 that are Endo H resistant, whereas PC2 was entirely sensitive to Endo H. Endo H cleaves only high-mannose-glycosylated forms and some hybrid oligosaccharides from N-linked glycoproteins. Therefore, Endo H sensitive proteins likely remain in the endoplasmic reticulum and pre-Golgi complex (43), whereas PGNase F cleaves nearly all types of N-glycans and sensitivity to it indicates that the protein is glycosylated. These findings suggest that PC2 is likely located in ER/pre-Golgi complex, whereas PC1 is only in part located in ER/pre-Golgi complex possibly in route to its final destination. The glycosylation analysis of PC2 AB precipitated protein demonstrated complete disappearance of a 220-kD PC2 band without additional bands other than the digested PC2 product. This result supports the notion that the glycosylated PC2 may stabilize the tertiary structure that facilitates PC2 dimer formation. Figure 7. Glycosylation analysis of PC1 and PC2. (A) Western analysis of protein isolated from TPK1 VSMC without digestion, hybridized with PC1 mAB 7e12. (B) Blot from the same protein after Endo H digestion, showing both Endo H sensitive and resistant fractions of PC1. 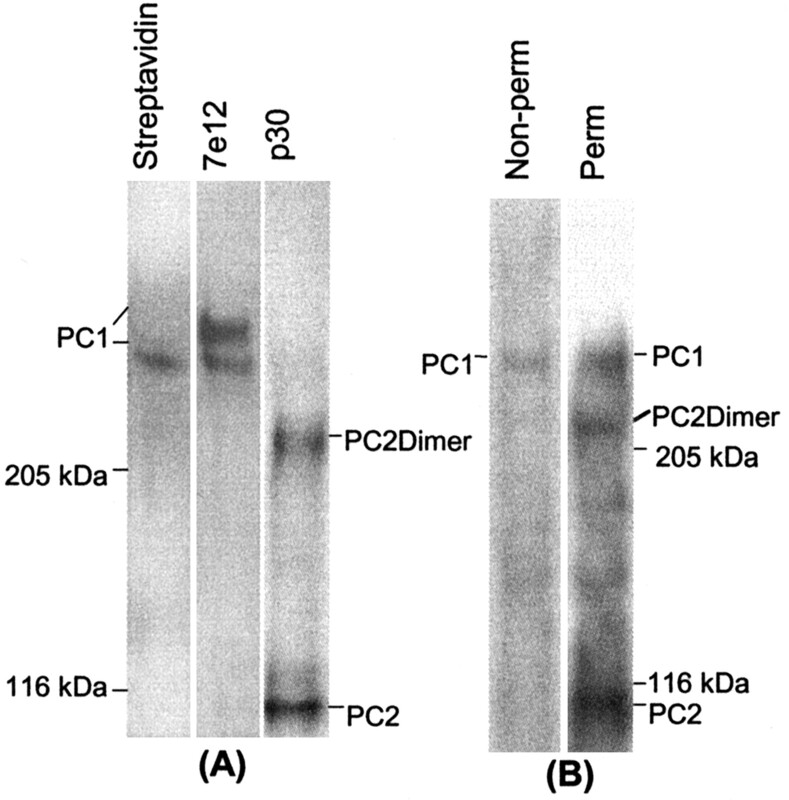 (C) Blot from the same protein after pNGase F digestion, showing PC1 sensitivity to pNGase F. (D) Western analysis of protein isolated from TPK1 VSMC without digestion, hybridized with PC2 polyclonal AB P30. (E) Blot from the same protein after Endo H digestion, showing that PC2 is Endo H sensitive. (F) Blot from the same protein after pNGase F digestion, showing that PC2 is sensitive to pNGase F.
The identification of PKD1 and PKD2 and their encoded proteins PC1 and PC2 have been major steps toward the understanding of ADPKD. The function of these proteins is not entirely understood, but current evidence suggests that PC1 is a cell surface receptor for an undefined ligand, whereas PC2 is an ion channel. Up to now, studies to determine their pattern of expression and their interacting partners have used renal epithelial cells, Xenopus oocytes and Chinese hamster expression systems, and in vitro systems such as the yeast two-hybrid and membranes reconstituted into lipid bilayers (37–39⇓⇓). The physiologic relevance of the expression of the full-length proteins or fusion proteins containing particular domains in artificial systems and the validity of extrapolating observations in epithelial cells to other cell systems affected by PKD1 or PKD2 mutations are uncertain. Despite the high prevalence of hypertension, the importance of vascular manifestations in ADPKD, and the expression of PC1 and PC2 in VSMC and certain endothelial cells, efforts to study the pattern of expression, interacting partners, and function of the polycystins in the vasculature have been limited. The results of the present study confirm that PC1 and PC2 are expressed in VSMC. Several bands larger than 400 kD and three bands smaller than 220 kD were detected by the PC1 mAB (7e12). Similar results have been described by Newby et al. (20) in kidney tubular epithelial cells, the smaller bands possibly being the result of cleavage or alternative splicing. As in that study, the smaller 220-kD PC1 protein band was not immunoprecipitated by PC2 AB (P30 or YCE2). Similarly, the PC2 AB (p30 and YCE2) recognized a band of approximately 220 kD, in addition to the 110 kD that corresponds to monomeric PC2. The 220-kD band, also observed in kidney tubular epithelial cells (20), which disappeared after deglycosylation, probably represents a PC2 dimer, although it could also be due to binding of PC2 to other unidentified proteins. Taken together, the expression of PC1 and PC2 in VSMC, along with the observation of clustering of intracranial aneurysms in certain ADPKD families (9,10⇓), the existence of an association between the location of mutations in the PKD1 gene and the occurrence of intracranial aneurysms (11), and the hemorrhagic phenotype of several Pkd1 and Pkd2 knockouts (14,15⇓) strongly suggest that the vascular manifestations of ADPKD are the direct consequence of the genetic defect, rather than an indirect complication caused by the presence of hypertension. As previously described in other tissues, the expression of PC1 in VSMC was highest during development and downregulated in adult animals (40,44⇓), whereas the expression of PC2 was more constant. This different pattern of expression may suggest a particularly important role of PC1 during the development of the vasculature. The results of the glycosylation analysis, biotinylation experiments, confocal immunofluorescence, and immunoelectron microscopy in the current study using VSMC are consistent with localization of full-length PC1 at the plasma membrane, whereas PC2 is exclusively—or at least mostly—located in the sarcoplasmic reticulum and intracellular structures. Despite these different subcellular localizations, the immunoprecipitation studies show that full-length PC1 and PC2 physically interact in TPK1 VSMC. This interaction was also observed in primary cultured VSMC from W/T newborn mice, confirming the in vivo interaction of PC1 and PC2. Taken together, these results are consistent with the interpretation that the interaction between PC2 and the fraction of PC1 located on the plasma membrane occurs across closely apposed plasmalemmal and sarcoplasmic reticulum membranes near the cell surface, as previously suggested for kidney tubular epithelial cells (39). This type of interaction is not unique. The association and functional interdependence of channel proteins in the plasma membrane and ER or sarcoplasmic reticulum membranes have been reported to occur in the skeletal muscle (between ryanodine receptor calcium release channels in the sarcoplasmic reticulum and plasma membrane dihydropyridine receptor calcium channels) and in cells transfected with the human TRP3 gene (between the IP3 receptor in the ER and the TRP3 channels in the plasma membrane) (45,46⇓). The close interaction between the plasmalemmal PC1 and the sarcoplasmic reticulum PC2 may be important to regulate the concentration of intracellular calcium and, through this, multiple intracellular processes, such as contractility; cellular differentiation, proliferation, and apoptosis; and production and secretion of extracellular matrix. The wall of the large elastic and medium-sized muscular arteries consists of the intima, media, and adventitia separated by the internal and external elastic laminae. The tunica media contains alternating layers of circumferentially arranged VSMC and interposing layers of elastic lamellae. The VSMC in each layer are arranged parallel to each other with the orientation of the cells and their surrounding elastic fibers changing from layer to layer. The dense plaques are specialized electron-dense areas along the side of the VSMC membrane. They are analogous to focal adhesions in epithelial cells and anchor the intracellular contractile filaments to the extracellular elastic lamellae, thus providing a mechanical and functional link to regulate the elastic and contractile tension of the stretched vessels (47,48⇓). PC1 has been found to be a component of large multiprotein complexes associated with cell-matrix contact at focal adhesions in low-density cultures of tubular epithelial cells and in association with adherens junctions and desmosomes in confluent cultures of renal epithelial cells (49,50⇓). The localization of PC1 and PC2 in proximity to the dense plaques is consistent with the observations in kidney tubular epithelial cells and with a functional role in the development and maintenance of the myoelastic structure of the arterial wall. In summary, ADPKD is a multisystem disorder with vascular manifestations that contribute to the morbidity and mortality of this disease. The results of this study strongly suggest that the pattern of expression of PC1 is developmentally regulated and different from that of PC2. The results also suggest that a fraction of full-length PC1 physically interacts with PC2, that this interaction likely occurs across closely apposed plasma and sarcoplasmic reticulum membranes, and that PC1 and PC2 are also found at the dense plaques, which are sites of cytoskeletal/plasma membrane/extracellular matrix interaction equivalent to the focal adhesion complexes in epithelial cells. These observations are consistent with an important role of the polycystins in the development, maintenance, and function of the myoelastic organization of the arterial wall. This work was supported by National Institutes of Health Grants DK 63064 (QQ) and DK 44863 (VET), and a Mayo Foundation Grant (QQ). We thank Susan Buhl for help on generating the YCE2 mAB.